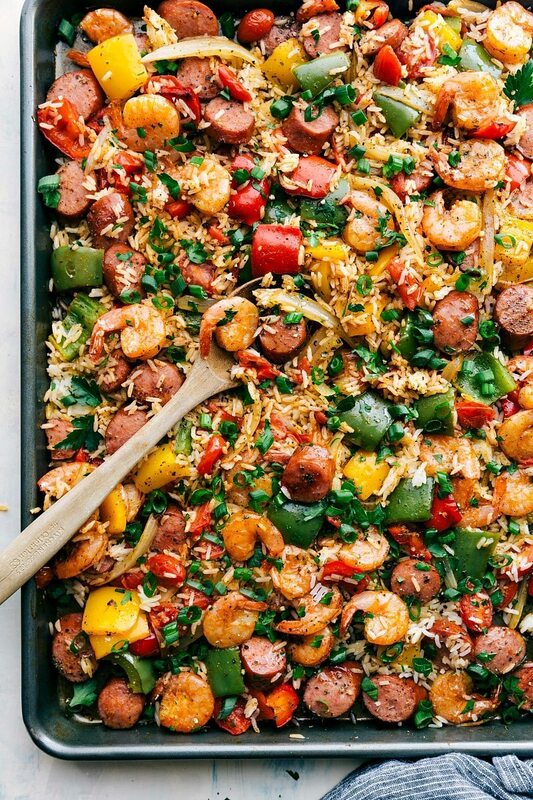 One Pan Jambalaya is an easy 30-minute meal of oven-roasted & seasoned sausage, shrimp, veggies, and rice all cooked together on ONE pan! One of the grocery stores near our home has little carts that younger kids can push around the store. Of course my toddler is obsessed with this and begs to go to that grocery store just so he can push his own miniature-sized cart. I push the babe in a larger (normal) cart and the toddler follows behind me pushing his miniature cart. He loves filling up his cart, but he is particular about what goes in it. Generally when we get to a food item I’ll ask him if he wants it in his cart or if it needs to go in mine. He’s very opinionated about these things because they are very important decisions. ? If it gets the “okay,” he’ll grab it out of my hands and place it in his cart. The other day, he was strangely not at all picky. He promptly grabbed every single food item I was looking at and raced back to his cart to put it in. A few rows down I turned around to check on him to find him shoving a ton of items onto a shelf and exchanging them for Oreos. Upon closer examination I found he’d replaced absolutely everything I’d put into his cart for the day. He’d replaced the food items with a variation of treats and other random foods. He explained to me that “I was getting yucky things.” Clearly he had to take measures into his own hands. ? So I started shopping AGAIN replacing all of the items he’d removed and this time they went into my cart. All the things he’d removed were the ingredients for this very dish (sheet pan jambalaya) so I was guessing he wouldn’t love the dish seeing as he wasn’t very pleased with the ingredients that make up the dish. But I couldn’t have been more wrong!! With the exception of eating the shrimp (he’s not a huge fan YET), he inhaled this dish. 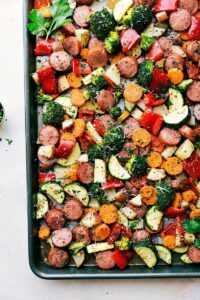 My boys call the turkey sausage “hot dogs” and go nuts whenever they are included in dinner (which explains the plethora of sausage meals on this blog ?) They also loved the rice and roasted veggies. I wish I could say that it’s not spicy at all because my kids ate it, but I do know my boys can seriously handle spice. That said I would say this is quite a mild dish. If you are worried about the spice, you can scale back the Creole seasoning and replace it with some more Italian herbs (oregano, parsley, etc.) but it will of course be less of a “jambalaya” flavor. 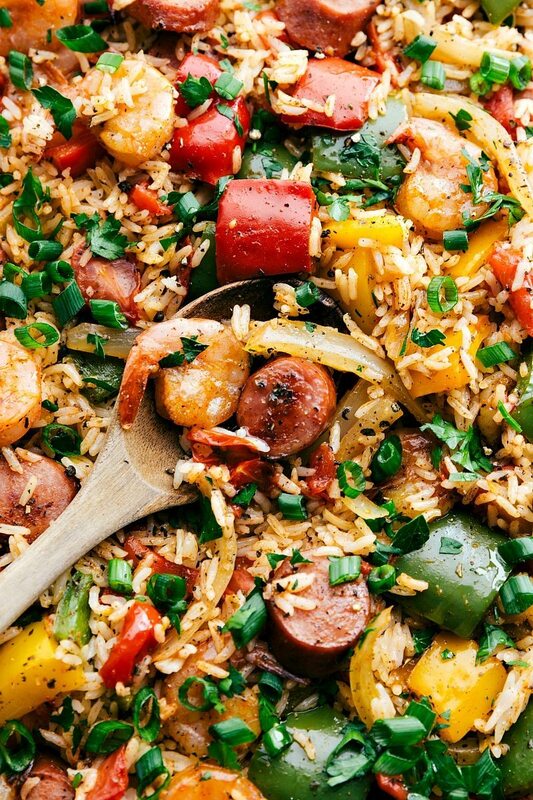 And last little disclosure; I know this is nothing CLOSE to an authentic Jambalaya, but it has some similar ingredients, spices, and flavors and a traditional jambalaya is what inspired this easier 30-minute dinner idea 🙂 Enjoy! 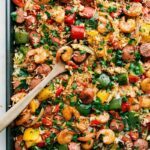 Sheet pan jambalaya is an easy 30-minute meal of oven-roasted & seasoned sausage, shrimp, veggies, and rice all cooked together on ONE pan! Preheat the oven to 425 degrees. 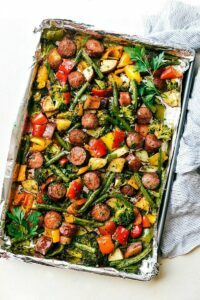 Line a VERY large sheet pan with foil, parchment paper, or spray with cooking oil. (As you can see in the video I fit this all on one sheet pan, but you'll need a very large one). Remove the stem and seeds and chop the bell peppers into 2-inch pieces. Halve and then thinly slice the onion. Slice the turkey sausage into coins. 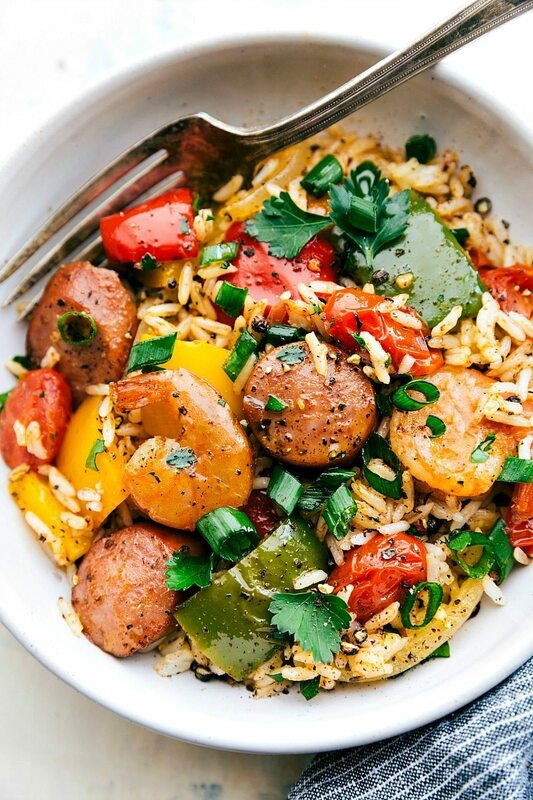 Place the cut peppers, onion, and sausage on a large sheet pan. Toss with 2 tablespoons olive oil, 1/2 teaspoon Creole seasoning, and Italian seasoning. Toss and bake for 8 minutes. Prepare the shrimp -- make sure it is deveined. If you want you can also peel it here OR *cook it with the peel on (the shrimp shells contribute a depth of flavor and are less likely to get overcooked). You can also remove the tail here if desired. Meanwhile, toss the shrimp with 1 tablespoon olive oil, 1/2 teaspoon Creole seasoning, and paprika. Take the sheet pan from the oven and add in the seasoned shrimp and tomatoes. Cook for another 6-8 minutes. Remove and add the packaged rice, salt (I use about 1 teaspoon - do it to personal preference), pepper (I add 1/2 teaspoon), and remaining 1 to 1 and 1/2 teaspoons Creole seasoning (to taste). Toss and then to the oven for 2 more minutes. Sprinkle with fresh green onions and fresh chopped parsley. Enjoy immediately. Haha! What a cute little grocery helper! Also, whenever I hear one pan meals, I am all ears. This looks so good! Haha!! 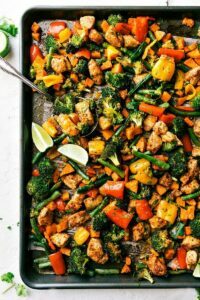 Well I’m glad you are liking these one pan dishes! 🙂 So you can definitely use either — I prefer the fresh shrimp from the seafood counter, but frozen will work fine with (as you said) just a slightly less “fresh” taste. For the frozen shrimp, follow the package directions to completely thaw it out and then dry the shrimp and it will be ready to use 🙂 The cooking time will be the same with thawed (frozen) shrimp. Enjoy! Hi Chelsea! How many cups prepared rice if not using the prepackaged rice? Thanks!! 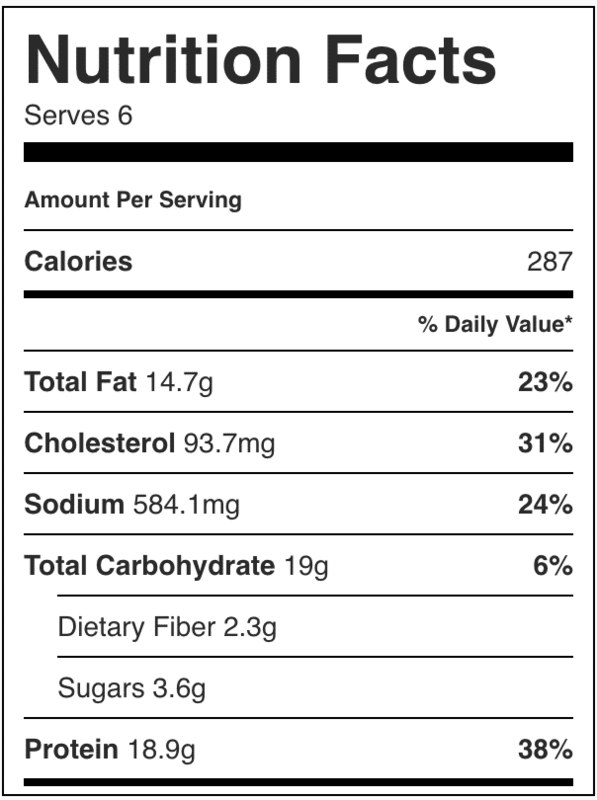 I’m the only seafood lover in my house, how would I substitute chicken for the shrimp? 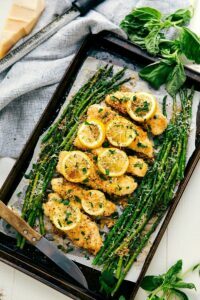 I haven’t tried chicken in this particular dish, but I’d cube it into pieces, add the seasoning + olive oil and cook it with the veggies at the beginning (so it gets about 20 minutes total cooking time and should register 165 degrees F on a meat thermometer). I’m so thrilled this was a hit! 🙂 Thanks so much for the comment Nicole! Do I cook the precooked rice in microwave before adding? Nope 🙂 Just throw it on the pan! I made this tonight and it was a total hit! Not only was it delicious but it took close to no time at all! Working 8 hour days and coming home to a four month old and hungry partner this is legit a life saver! 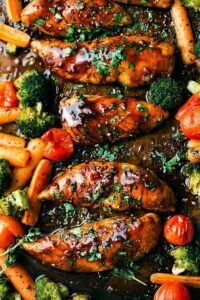 I will definitely be checking out more recipes from this site!